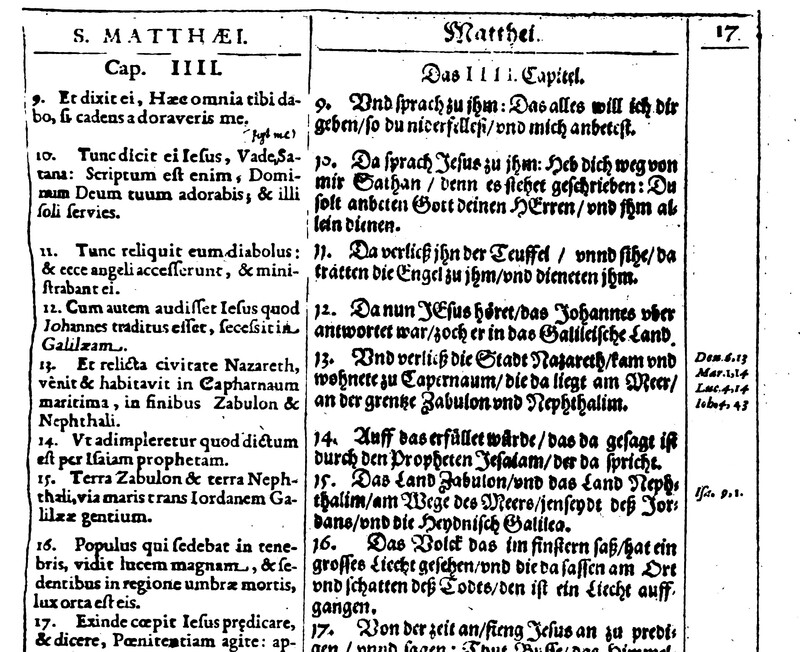 The Latin and German panels for opening verses of Matt. 4. From the late colonial period to the time of Joseph Smith, important forces were at work that changed the nature of preaching. Most sermons in the late colonial period were read. Whether from small briefs carried into a pulpit, scribbled notes on a quarter sheet of foolscap, or carefully fleshed out thoughts in tempered script, preachers expanded from their notes or read word for word, but in general followed a written pre-planned text. There is a paper trail there. During August 9-11, 2012, the Association for Documentary Editing will be holding its Annual Meeting in Chalottesville, VA. Plenary speaker is Peter Hatch. Sermons in antebellum America were both innovative and derivative. While disestablishment opened wider the doors of American Religious Culture to the radical, it also strengthened the radical establishment (by that I mean the unsettled Methodists and Baptists). Preachers naturally came in similar breadth and hence their sermons found all sorts of niches in which to settle. Sitting here, post Sunday morning session and thinking about the meaning of ordination, it occurred to me that there is an interesting connection between our practice of “line of authority” and the adoption practices of Latter-day Saints prior to 1894. That angelic connection between the here and now and Deity is powerful. There is a wonderful attraction in it. I see this as another aspect of our Mormon heritage. The immediacy of it all.